Long time no see! A planned one week break from the weekly turned into a much longer hiatus. This issue is a digest version of the second half of the 2017 Fall season. The subsequent issue will bring us up to current with the 2018 Winter season and will be out as soon as I can work through it. Things will be back to normal after that. Some of you know that I have two young children. The older one entered first grade in the fall and the other just started his Terrible Twos, so the fog of busyness, stress and fatigue that is a universal constant of parenthood has become more intense than usual. I had wanted to take a week off just to handle some mundane errands, flu shots, visa renewals—nothing major. At the same time, a lot of deferred maintenance, cleaning and organizing—some of which had been accumulating since the second baby was born—all caught up to me. I decided I would clear it all out in one swoop, which needed a couple more weeks, then return fresh. But away from the daily routine of watching shows and logging information for the weekly review, my mind had bandwidth to stew on my longer term plans for anime tourism study, plans I’ve had for a while but that keep getting pushed down the road without really growing. Quite a few people have suggested writing a book. I know this is a good platform for many subject matter experts to demonstrate knowledge and layout a thesis of some kind. In my heart, though, I’d really like it to be something that uses richer storytelling tools and would be something that only I could make. I want it to be a documentary film. I’ve brought this up with close friends in the butaitanbou community in private meetings over the past couple of years. Getting their input and probing for interest level in giving an interview or working together isn’t something I want to rush. But I’ve also used my busyness as an excuse to not pursue it with more vigor. There is also a lot of work I need to do by myself, such as concept development, preliminary storyboarding, camera and gear selection, budget, etc. These take time and deep thought. I decided to take some more time to at least lay some groundwork for this solo planning. I’m still far from finished, but am happy with the progress I made and think I have enough momentum now to keep it moving. In the past, I’ve done multi-week cumulative issues of the weekly review when I’ve taken vacations. This one is a little different in a few ways. Because there is so much content, I gave each series its own page and link to them below. The screenshot captions are not as deep as usual, though I’ve included train stations, well-known landmarks, and any other places that were easy to lookup without digging around. There is no commentary. I abandoned the second half of Wake Up, Girls! Shin Shō, not because of the mediocre production value (which we knew about from the start), but because Sendai almost never appears in the show! I also won’t include the six episode second season of Yūki Yūna wa Yūsha de Aru. I like the show, but Kan’onji has a very minimal role in this follow up. Most of what does appear I’ve covered before, when the first season was broadcast. Going forward, I’ll be thinking about additional workflow optimizations (after doing this for five years, I’ve found most of the easy ones), but also structural changes to the weekly review that would allow me to keep it going in some form or another, without burning myself out, and still leave plenty of time for other things that need attention. The documentary is my big hairy audacious goal, but I also have photography for articles about my own seichijunrei adventures going back to 2015 that I’ve yet to write, and Japan shōtengai photos going back to 2014 that have yet to see the light of day. I’d like to get to those before my memory of them starts to become hazy, and I think you’ll enjoy seeing and reading them too. Nikkei Trendy published an article about the history of anime-induced tourism in Saitama Prefecture, more broadly the recent growth in formal collaborations between anime productions and local government throughout Japan, and commercial tours and other products targeting this market. Mainichi Shimbun published an article about the continued use of Cafe Dream in Nishinomiya, Hyōgo Prefecture as a third place by both Japanese and overseas fans of the Suzumiya Haruhi series, despite the restaurant’s relocation from the original physical premises used as a model for the setting of the works. Nishi Nippon Shimbun published an article about anime pilgrimage to Tanegashima for Kimi no Na wa., Byōsoku Go Senchimētoru, and Robotics;Notes. Jōnan Shinpō published an article about how chocolatier Choco de Ninmari became a third place for fans of Hibike! Euphonium to meet while on pilgrimages to Uji, Kyoto Prefecture. Netorabo published a report from the 2017 Ōarai Ankō Matsuri. The regional festival has grown significantly in recent years due to the influx of anime pilgrims for Girls und Panzer. Saitama Shimbun published an article about hatsumōde visits to Washinomiya Jinja by Lucky Star fans. @lidges made a memory-based pilgrimage to multiple Tokyo locations for theatrical film Tokubetsu-ban Free!-Take Your Marks-. @paffue made a pilgrimage to Haneda Airport and Sapporo for the PV to Eiga Chūnibyō demo Koi ga Shitai! -Take On Me-. @fureshima2223 made a pilgrimage (post 1, post 2) to Hannō, Saitama Prefecture for OVA Yama no Susume: Omoide Present. @lidges made pilgrimages to (post 1) Kan’onji and Sakaide; and (post 2) Ibukijima, Kan’onji (all Kagawa Prefecture) for Yūki Yūna wa Yūsha de Aru: Yūsha no Shō. @keihi49 made a pilgrimage series (index page) to Kan’onji, Marugame and Sakaide (all Kagawa Prefecture) for Yūki Yūna wa Yūsha de Aru: Yūsha no Shō. @keihi49 made a pilgrimage series (index page) to Sakaide, Takamatsu, Zentsūji, and Mitoyo (all Kagawa Prefecture); and Kyoto for Yūki Yūna wa Yūsha de Aru: Washio Sumi no Shō. 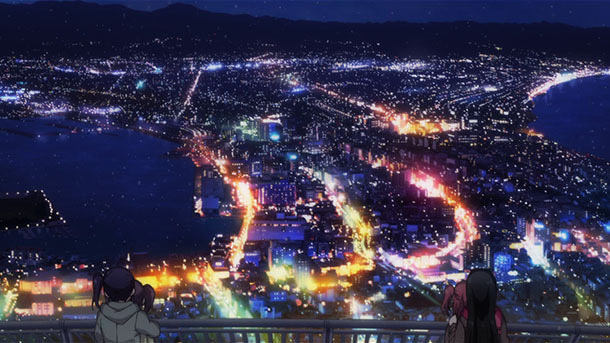 @Surwill made a pilgrimage to Ōarai, Ibaraki Prefecture; Ariake, Kōtō Ward and Akihabara (Soto-Kanda), Taitō Ward (both Tokyo Metropolis) for Anime-Gataris, including a detailed analysis of the anime pilgrimage subculture points discussed in the show. @miyaken46 made a pilgrimage to Ariake for Anime-Gataris. @Surwill made a pilgrimage (part 1, part 2) to Harajuku, Shibuya Ward, Tokyo Metropolis for Urahara. @Surwill made a pilgrimage to Akihabara (Soto-Kanda), Ariake and Shibuya (all Tokyo Metropolis) for Blend S.
@paffue made pilgrimages to (post 1) Tokyo and Fuchū locations; and (post 2) New Chitose Airport and Sapporo, Hokkaidō Prefecture for Imōto Sae Ireba Ii. @yamagishi made a pilgrimage to Okinawa for Imōto Sae Ireba Ii. @touyoko_com (post) and @lidges (post) made pilgrimages to Kinosaki Onsen in Toyooka, Hyōgo Prefecture for the Kobayashi-san Chi no Maidragon OVA. @mikehattsu made a pilgrimage (post 1, post 2, post 3, post 4) to Kyoto for Uchoten Kazoku and Uchoten Kazoku 2. @nadukari_h made a pilgrimage to Toyama City, Toyama Prefecture and Tokyo for Sakura Quest. @paffue made a pilgrimage to Mitaka, Tokyo Metropolis for Sagrada Reset. @nagisaya_blog made a pilgrimage to Tachikawa, Tokyo Metropolis for Frame Arms Girl. @touyoko_com made a pilgrimage to Cape Sōya in Wakkanai, Hokkaidō Prefecture for Gabriel Dropout. @mikehattsu made pilgrimages to Uji (post 1, post 2, post 3, post 4, post 5, post 6, post 7, post 8, post 9, post 10) and Kyoto, Kyoto Prefecture for Hibike! Euphonium and Hibike! Euphonium 2. @626shin made a pilgrimage to Uji for Hibike! Euphonium 2. @miyaken46 compiled multiple pilgrimages to Uji for the OP to Hibike! Euphonium and Hibike! Euphonium 2. @taiyaki0628 made a pilgrimage to Uji for Hibike! Euphonium. @fureshima2223 made a pilgrimage to Kashiwa, Chiba Prefecture for Stella no Mahō. @mikehattsu made pilgrimages to (post 1) Sendagi, Bunkyō Ward, Tokyo Metropolis; Ōgaki, Gifu Prefecture (post 2, post 3, post 4, post 5, post 6, post 7, post 8); Yōrō, Gifu Prefecture (post 9, post 10); and Nagashima Spa Land in Kuwana, Mie Prefecture (post 11, post 12) for Koe no Katachi. @mikehattsu made pilgrimages to Omotesandō, Tokyo; Nagoya Station; and Hida, Gifu Prefecture (post 1, post 2, post 3) for Kimi no Na wa. @mikehattsu (post 1, post 2, post 3, post 4, post 5) and @Idolmeister (post) made pilgrimages to Hirosaki, Aomori Prefecture for Flying Witch. @kbt_tigers1985 made a pilgrimage (post 1, post 2, post 3, post 4) to Matsumoto, Nagano Prefecture for Orange. @touyoko_com made a pilgrimage to Matsue, Shimane Prefecture for Noragami Aragoto. @taiyaki0628 made a pilgrimage to Tsumekizaki Park in Shimoda, Shizuoka Prefecture for Charlotte. @teo_imperial made a pilgrimage to Hachiōji, Tokyo Metropolis for Himōto! Umaru-chan. @fureshima2223 made a pilgrimage to Doai Station and Tanigawadake in Gunma Prefecture for Yama no Susume Second Season. @harumukotan made a pilgrimage (post 1, post 2) to Kamakura and Fujisawa, Kanagawa Prefecture for Ping Pong the Animation. @harumukotan made a pilgrimage to Tokyo locations for Kara no Kyōkai: Mirai Fukuin. @mikehattsu made a pilgrimage (post 1, post 2, post 3, post 4) to Ōarai, Ibaraki Prefecture for Girls und Panzer.and Gekijōban Girls und Panzer. @mikehattsu made a pilgrimage to Kyoto (post 1, post 2); and (post 3) Tango-Yura Beach in Miyazu, Kyoto Prefecture for Tamako Market. @mikehattsu made pilgrimages to Narita Airport, Tokyo Metropolitan Government Building, Kyoto (post 1, post 2, post 3, post 4, post 5, post 6, post 7), Uji, and Yuragawa Bridge in Miyazu, Kyoto Prefecture for the K-On! series. @yamagishi made a pilgrimage to Paris, France for Nodame Cantabile. @mikehattsu made a pilgrimage (post 1, post 2, post 3, post 4, post 5, post 6, post 7, post 8) to Nishinomiya, Hyōgo Prefecture for the Suzumiya Haruhi series. @11922911Rinngo made a pilgrimage to Cape Tappi in Aomori Prefecture for Clannad. @mikehattsu made pilgrimages to (post 1) Yuragawa Bridge in Miyazu, Kyoto Prefecture; and (post 2) Obama, Fukui Prefecture for Air. @harumukotan made a pilgrimage to locations in Tokyo; the Meiji-mura Museum in Inuyama, Aichi Prefecture; and Kōbe, Hyōgo Prefecture for Brigadoon: Marin & Melan. Welcome back! I’d wondered what had happened… And I understand Real Life has to take precedence. Thanks :) Real life can be a cruel master.